Listen to "Isaac Newton" on your iOS and Android device. James Gleick has long been fascinated by the making of science -- how ideas order visible appearances, how equations can give meaning to molecular and stellar phenomena, how theories can transform what we see. In Chaos, he chronicled the emergence of a new way of looking at dynamic systems; in Genius, he portrayed the wondrous dimensions of Richard Feymnan's mind. Now, in Isaac Newton, he gives us the story of the scientist who, above all others, embodied humanity's quest to unveil the hidden forces that constitute the physical world. 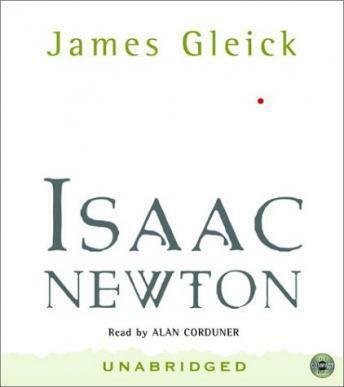 In this original, sweeping, and intimate biography, Gleick moves between a comprehensive historical portrait and a dramatic focus on Newton's significant letters and unpublished notebooks to illuminate the real importance of his work in physics, in optics, and in calculus. He makes us see the old intuitive, alchemical universe out of which Newton's mathematics first arose and shows us how Newton's ideas have altered all forms of understanding from history to philosophy. And he gives us a moving account of the conflicting impulses that pulled at this man's heart: his quiet longings, his rage, his secrecy, the extraordinary subtleties of a personality that were mirrored in the invisible forces he first identified as the building blocks of science. More than biography, more than history, more than science, Isaac Newton tells us how, through the mind of one man, we have come to know our place in the cosmos. This is an interesting book that reveals a side of Newton, and, indeed, science of the time, that I have not known about before. Our system of scientific advancement was created: research followed by open publication. The secretive work of alchemists was on the way out. Other interesting threads were the conflicts with Hooke and Liebniz. Both of us listening this time are from technical backgrounds. We were concerned that the mathematical parts would be unsatisfying. While they turned out to be pretty basic, there was enough detail to pique our interest. We may follow up with some more detailed reading. The only shortcoming for us was the extreme volume dynamics of the narrator. We found ourselves adjusting the volume quite a bit. Only for the truly devoted fan. While very insightful into what shaped Newton's mind (and his petty, paranoid nature), there isn't much drama. If this book were made into a movie it would be one of those movies you were forced to watch in school. Brilliant. Both the book and the man. I thoroughly enjoyed this one. There was a great feeling of being there. Newton was one of the great minds of all time, and you felt it in the book. A tortured savant that couldn't deal with others. Well done. If you love biographies - this is a must read. While very well written and an interesting portrait of Newton, this book leaves you wanting to know more than what you're given, particularly about Newton's childhood. However, for those who found the weighty scientific analysis in other inventors'/scientists' biographies (see the new Einstein by Walter Isaacson) overwhelming, this book provides a bit of a relief. Not perfect, but very good nonetheless. The author is one of the best science writers around these days. I enjoyed his biography of physicist Richard Feynman, and got this one on that basis, as well as "Chaos." The volume did not disappoint. He sets what could be an overly familiar story in its time, bringing new insights as we watch Isaac Newton, quirky, eccentric, exceedingly methodical and brilliant, help invent modern science if not much of modernity. The volume is nontechnical for the general reader, yet elucidates many of Newtonian concepts clearly. I enjoyed the reader's British accent, appropriate for this subject matter. Recommended! I thoroughly enjoyed this book. The Author did a wonderful job of making a story out of, what could have been, a very dry topic. To be sure a technical understanding of math or science is not necessary. In addition, the presenter did a great job and his voice added to my enjoyment. I am definitely not a math guru but I thoroughly enjoyed this book. It was interesting to get a peek into the past when numbers took on more meaning, the developing of calculus, and finding out about other experiences of Newton's life kept my complete attention. I recommend this book. [unabridged] A must read for anyone learning calculus. If you are a student of mathematics, physics, or engineering, you must "read" this book. You will gain a much better understanding of calculus, how it was developed, and how Newton employed it to explain so many of the observed physical properties of our universe. This is not a technical manual requiring a knowledge of calculus to follow along; anyone who has taken high school physics will also enjoy this book. I also recommend this book as an introduction to anyone planning to study quantum mechanics or Einstein's theory of relativity. Good book, held my interest. Learned a lot about Newton but did not seem to get tangled up with dates like most history books. When selecting this book, consider your preferences. If you are looking for a novel or biography, this isn't your book. Isaac was a very introverted man (according to the author) and therefore, did not lend himself to a biographical study. If instead, you are intrigued by the details and science as I am, this was a very good read. You still have the opportunity to learn about Isaac the man however.